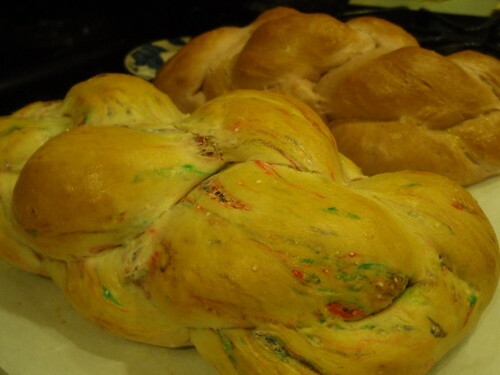 The Tie Dye Challah in all it's glory. 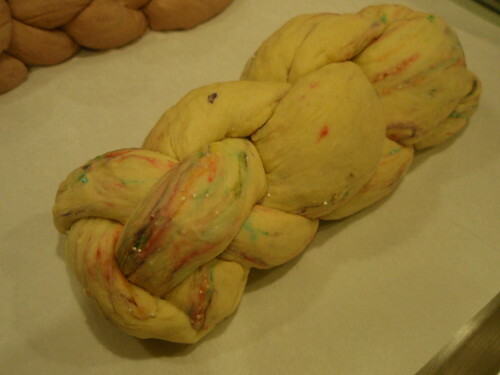 Tie-dye challah, a Purim-related delicacy (or it should be), was inspired by Leigh Ann at The Frugal Ima's Funfetti Challah. I am proud to say that I (initially FAILED). 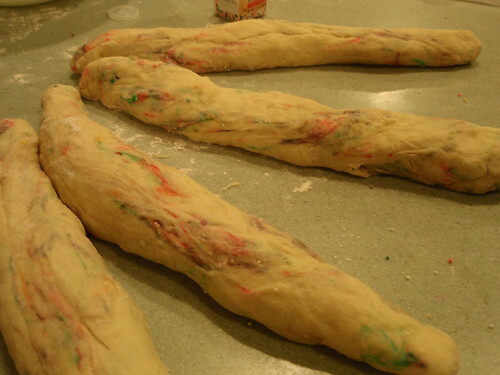 Remember, when you were at summer camp, and you were learning how to tie dye shirts... If you mix all the colors together too much, then you get a sort of brown. Well, Leigh Ann suggests Jimmies, but I didn't have them. I'll just be resourceful, I told myself. 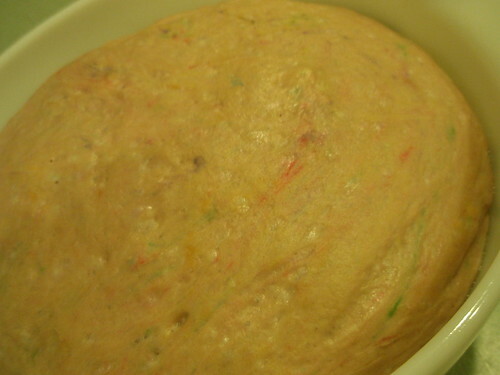 So, I thought it would be brilliant if I mixed the rainbow non-pareils in with the flour. You know, nice all over color look. 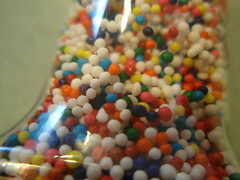 Well, all the color CAME OFF the non-pareils. 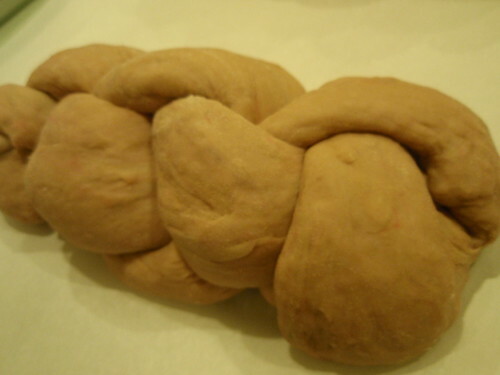 Fortunately, when I made this challah the reds and pinks sort of dominated, so at least we got PINK, quite princess-y dough. 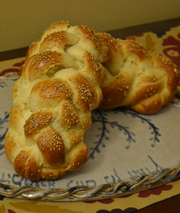 In order to rectify the situation, I quickly whipped up a second batch of plain dough and kneaded in the non-pareils just before braiding. This all would have been easier if I had had "Jimmies" in the house, like she suggests. But I didn't. So, here is the result of both methods! I used my small batch recipe. 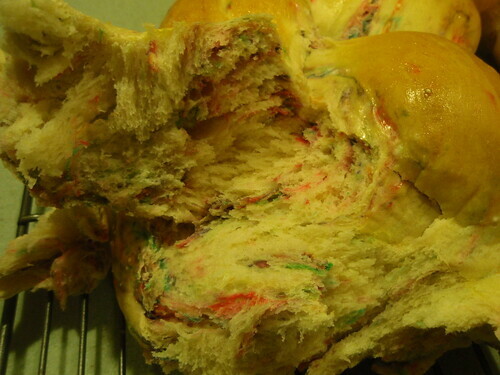 Luckily, it tastes delicious! Now, to the store for Jimmies!